SORRY, TODAY'S EVENT HAS BEEN CANCELLED, PLEASE JOIN US NEXT MONTH. 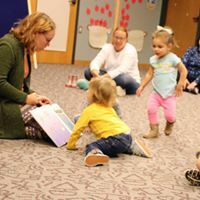 Join Dare to Dream Theatre Artistic Director Rachel Thuermer in a workshop designed to engage toddlers and their grown ups through creative and dramatic play. Discoveries during sessions may be used in development of a new theatre experience designed especially for youngsters and their families: Theater for the Very Young. Recommend for children ages 18 months through 5 years with a caregiver.